There aren't many games where the players compete to see who can end the world fastest. If you like to revel in your dark side, intentionally bring about the apocalypse, and do it all for a low, low price, then we've got the game for you. Sure, it bombed in the marketplace and is no longer published, but that just makes it cooler. Hecatomb is a collectible card game produced a few years ago by Wizards of the Coast. Each player is an Endbringer seeking to bring about global apocalypse with the help of various foul minions and evil deities. It shares some mechanics with Magic: the Gathering, but it differs from every other CCG in two ways. First, the subject matter is mature. The horror theme is expressed with some pretty graphic and disturbing cards that straddle the line between PG-13 and R. The cards themselves are also very different. The pentagon shape takes some getting used to, and the cards are printed on flexible plastic, which also feels a little weird. The idiosyncratic design isn't just for aesthetic purposes - certain sections of the cards are transparent, and the game allows you to stack them together, creating hybrid abominations to do your bidding. The parts of the cards that show through create interesting combinations of abilities and effects. It's pretty cool. Unfortunately, Hecatomb failed miserably, and Wizards no longer supports it. There's a silver lining though. Low demand means you can pick up large quantities of cards for bargain prices. I scored a few booster boxes (yes, entire boxes of booster packs) at Origins last week for $10 each. I've found them online for as little as $9 per box. If you have some friends who enjoy creepy horror-themed games, you can build a decent collection for the price of dinner and a movie. 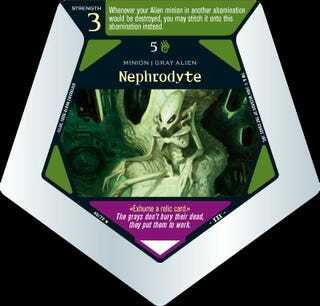 While a lot of the cards are centered on demons, undead and other supernatural beings, the final expansion, Blanket of Lies, focused on three races of hostile aliens invading Earth. There's some great sci-fi weaponry and a bunch of nefarious government agents prepared to take out anyone who knows too much. So just play dumb. Images by: Wizards of the Coast.